We may be far, far away from Italy, but Bangalore surely has embraced the pizza. And we have come a long way from the thick, doughy versions that were introduced to us a couple of decades ago. Now, our thin-crust wonders come sprinkled with all kinds of awesomeness. And a few even dare to walk down the wacky path with aplomb. For those of you who think pizzas should come loaded with Butter Chicken, Veg Manchurian, and brownies — here’s where you can sign up! This popular ice-cream parlour and the cafe attached to it offers a variety of short eats. These include a line-up of pizzas that come packed with North Indian food flavours. Our pick in the creamy Butter Chicken version. Instead of the boring old tomato sauce, the base comes covered in a thick, luscious gravy that includes juicy bits of chicken. And is, then, topped with a generous dose of cheese. For those of you with a sweet tooth, this one will work perfectly. 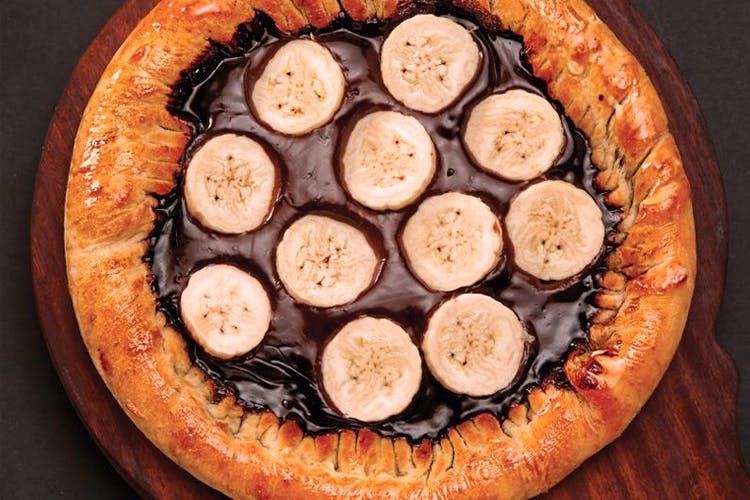 The golden, flaky base is layered with gleaming, liquid chocolate and, then, topped with slices of banana. We suggest you stop judging and pick up a slice! Puh Se Pizza, in Koramangala, is the motherload when it comes to whacky pizzas. Chief among them is the Nagin Dance that features the devilishly spicy Andhra Chilly Chicken. The chunks of chicken are shallow-fried in a fiery, green masala before being plonked onto the pizza and are then coated with cheese. For the veggies, there is the Maska Pizza which comes topped with the butter-filled, tangy Pav Bhaji masala that’s adorned with cheese and fresh bits of onion. For more details, click here. Pizza and pasta come together for this one. Popular with patrons for its selection of wood-fired pizzas, this restaurant packs in plenty of quirk with their Cheese Masala Macaroni offering. The wafer-thin crust comes stack with gooey cheese-loaded pasta that’s got just the hint of spice. We also have our eyes on the Braziliano that comes sprinkled fried-up potato sticks. For more on The London Curry House, click here. Since fusion reigns supreme here, you can expect your pizzas to come topped with the unusual. There’s the Chicken Lababdar where the tomato sauce is replaced by a creamy, tomato-based gravy that’s got a good amount of spice to it. There’s also the Veg Manchurian Pizza where veggies of all sorts are tossed in spices and sauces and crisped up in the oven for your eating pleasure. Listed under their sweet treats section, the Brownie Pizza at this coffee shop has plenty of takers. Chocolate-loaded brownies are crumbled on top of the pizza base. Chocolate sauce is drizzled on and then it hits the microwave. What you get is a crisped-up pizza that includes the wonderfulness of a warm, chocolate brownie. Didn’t include your favourite wacky pizza? Tells us about it in comments!